The 9pc Pink and Navy Blue Fox Patch baby bedding collection by Sweet Jojo Designs will create a unique and modern look for your nursery. 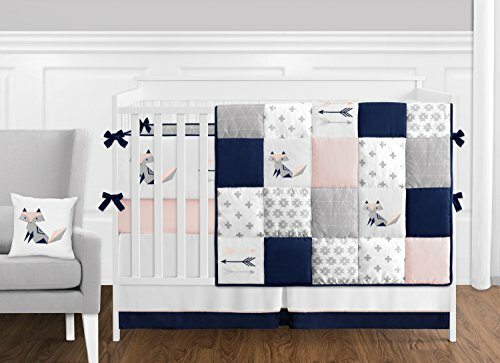 This designer patchwork crib bedding set uses a sensational collection of brushed microfiber patches combined with applique and embroidery works of origami foxes and arrow embellishments. It boasts an impressive array of exclusive fabrics combining geometric and tribal prints. These stunning prints are paired with pink, navy blue and white solid fabrics. The contemporary color palette of blush pink, navy blue, grey and white will set your nursery up in high style. This Sweet Jojo Designs set will fit all standard cribs and toddler beds and is machine washable for easy care and repeated use. Sweet Jojo Designs creates various coordinating room accessories for all of their children's bedding sets including wall decor, hampers, lampshades and window treatments.